This school (1928 to 1955), a Rosenwald one, was the first for black students in Loris and other nearby communities. When the school closed in 1955 its students were transferred to the Finklea Consolidated High School, where George C. Cooper (1915-1991) served as principal until it closed with desegregation in 1970. 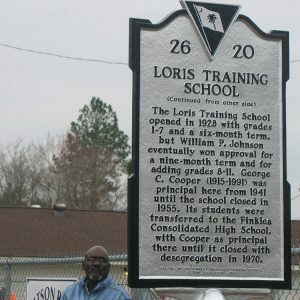 Marker erected by the Finklea High/ Loris Training Schools Alumni Association, 2008.